Following 2005’s sour-faced masterstroke, Chaostream, Lost Soul return after four years with Immerse in Infinity; a real blast of a record that will probably end up bothering my “best of” lists come Christmas time. Their sound hasn’t changed too substantively over the years since their beginnings. They featured on Relapse’s Polish Assault before they’d released any records, and soundwise they fitted right in with that scene alongside other bands showcased there such as Yattering and Decapitated. 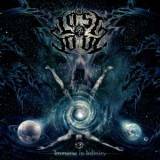 Deep, violent, grooving death metal, and in Lost Soul’s case usually supplemented with flashy, well-conceived melodic solos adding taste. What their sound has done, however, is developed, broadening its scope greatly without ever diluting its death metal basis. So they’ve expanded within, rather than beyond, their genre. So sometimes this has the pounding quasi-blackened tremolo majesty of Behemoth, but at other times it has the primal, swinging approach of Chaos AD-era Sepultura. On top of that, the thing is laced in many places with clear, wailing Nile-esque tonalities in their ubituitous harmonised lead lines. They’ve also become more sophisticated in terms of songwriting. Immerse in Infinity is rather a clever album, with a lot going on, both melodically and rhythmically. So take a tune like …If the Dead Can Speak. We begin with a deceptively knuckle dragging crunk, which, as my colleague Zadok might say, has almost a “jumpdafuckup” quality about it, with very Igor Cavalera-inspired drumming. But progress further into the song and we find rich strokes of melodic colour giving this extra layers, both texturally and emotionally, that it never appeared able to have at first, making it a composition of genuine structural crafting. It culminates in a rather superb guitar solo, to boot. 216 is another highlight, with tremolo riffs twisting like a rodeo horse, sporadically harnessed by glimmering layers of melodic lead guitar playing. Demonstrating the newfound depth of the band, this builds and builds into something massively epic, sounding like it should be the soundtrack to Ben Hur, or somesuch lengthy swords ‘n’ sandals film. One Step Too Far also twists and turns urgently through compellingly jarring compositional ideas unpredictably and challengingly. This is a big step up for an already good band, and deserves plenty of attention from death metal fans. They are an underrated act, and this record can stand alongside the highpoints of 2009’s death metal scene without yielding an inch.